One cell type can fight disease, help form blood vessels, regulate cell stability— and more. Macrophages are true masters of multitasking. In our body they are the first line of defense against invading bacteria, fungi and viruses. But they are not only a key element of our immune defense; they can also play a role in destroying tissue, and promoting diseases. This makes macrophages extremely interesting for research, and they show extraordinary potential for new therapeutic approaches. They taught their cells to fly. That’s what researchers of the University of Zurich had to do to fulfill a prerequisite for their experiments. They needed to make their research subject weightless. Professor Oliver Ullrich and his team wanted to examine the impaired function of monocytes and macrophages in microgravity (Paulsen, et al., BioMed Research International 2015). Sending macrophages into parabolic flights is one of the many research projects that have advanced these special cells to celebrity status in the scientific community. High-flying experiments such as these provide new opportunities to expand our knowledge, and they offer potential benefits for medical research. When Ilya Metchnikoff first described macrophages and their phagocytic nature more than 100 years ago, he couldn’t have imagined their variety in even his wildest dreams. These cells are so functionally diverse that they are the most plastic cells of the hematopoietic system. Their role as “big eaters” puts them in the first line of defense against infectious agents. Microbes attack our body continuously, which leads to the activation of the innate immune system and to protective inflammatory responses. Professor Ullrich from the University of Zurich teaches his cells to fly. With his group, he investigates impaired functions of immune cells in microgravity. The photo was taken at the 19th parabolic flight campaign by the DLR in 2013. Picture kindly provided by Professor Oliver Ullrich. However, the central role macrophages play in the immune system cannot overshadow their importance in the development and homeostasis of many tissues. Studies have shown their importance during erythropoiesis and angiogenesis, as well as in brain development (Wynn, et al., Nature 2013). Macrophages also help maintain a balance in organs such as the liver, pancreas and fat tissue, and they play an important role in regulating cell synergy and supporting our body as it adjusts to changes in the environment (Wynn, et al., Nature 2013). And since they are also involved in many diseases, macrophages are increasingly important for biomedical research. Many different types of macrophages exist. These professional phagocytes are a heterogeneous population of functionally diverse cells with different origins. They can rapidly change their phenotype in response to variations in their environment. Researchers have tried to classify macrophages based either on their belonging to the mononuclear phagocytic system, their origin or their functional phenotype. According to the inflammation state, one can differentiate between M1- and M2-macrophages. Traditional classification tells us that IFNγ-activated M1 macrophages have inflammatory functions and are crucial for resistance to pathogens and their elimination. Alternatively, IL-4-activated M2 macrophages have mostly anti-inflammatory functions and are important for maintaining tissue integrity. However, in contrast to the good work they do when fighting diseases, M2-like macrophages are also found in several cancer types where they can promote tumor growth (Komohara, et al., Cancer Sci 2014). Macrophages are found in almost every organ. They protect the human body, but they are also involved in the pathogenesis of diseases, including autoimmune disorders, chronic inflammatory syndromes, fibrosis and cancer. Their research applications are vast, and in vitro assays are increasingly used in a wide range of research areas, including immunology, bacteriology and parasitology, as well as in biomedical and transplantation studies. Two advantages of macrophages in cell culture are that they are relatively easy to generate and to cultivate. One example for the plethora of applications in research: Those “big eaters” have helped scientists to unravel different aspects of cancer development. These phagocytes are found in solid tumors, where they are associated with poor prognosis (Kishore, et al., JNCI 2015). Tumor-associated macrophages can help the metastatic spread of tumor cells, as they stimulate their migration and invasion of different tissues, and the suppression of immune responses. Macrophages also play an important role in the development of chronic diseases, such as arteriosclerosis, asthma, inflammatory bowel diseases, rheumatoid arthritis and multiple sclerosis. Following tissue damage by infections or injuries, these cells are recruited to the affected tissues with the aim of eliminating the invaders and restoring the integrity of the body. At the same time, regulatory macrophages should come onto the scene and help avoid an excessive response that could cause collateral damage. Unfortunately, this latter step does not always happen, resulting in chronic inflammation or autoimmune processes. With its response to bacteria, the body walks a tightrope, trying to fight invaders while also regulating immune cells to prevent excessive tissue damage. Straightforward generation of functional macrophages. 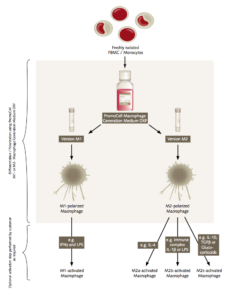 PromoCell´s Macrophage Generation Medium DXF allows for generation of M1- or M2-polarized macrophages directly from peripheral blood mononuclear cells (PBMC). 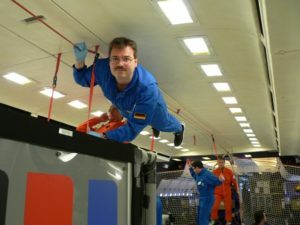 Professor Ullrich’s microgravity experiments have helped researchers to better understand factors that could inhibit the macrophages many functions. In vitro assays with macrophages showed that some intravenous iron preparations for the treatment of anemia in chronic kidney disease patients impair the differentiation from monocytes to macrophages and also affect mature dendritic cells (Fell, et al., Nephrol Dial Transplant 2016). If you want to work with macrophages in vitro, you need a sufficient number and purity. But there is a problem: Although mature differentiated macrophages can be found in various human tissues, they are only present in very low numbers. Moreover, they cannot proliferate in vitro. The easiest way to obtain macrophages is to isolate peripheral blood cells and differentiate them with specific media. These monocyte-derived macrophages (MDM) are functionally equal to tissue macrophages. PromoCell’s M1- or M2-Macrophage Generation Media are defined and animal component-free complete media systems for the generation of MDM. They allow the differentiation of macrophages directly from PBMC without the need for additional bead-based purification of CD14+ monocytes, enabling the use of healthy, untouched cells without the interference of animal stimuli. Thanks to major advances in the understanding of macrophages’ biology, scientists are rapidly developing new therapeutic targets. Their efforts focus on enhancing or inhibiting macrophages’ responses to different stimuli, and the results of such experiments might help cure infectious diseases and autoimmune diseases – and even cancer. Such sky-high ambitions are certainly worth a session of weightlessness. Learn within our latest application note how to differentiate monocytes or peripheral blood mononuclear cells into M1- or M2-macrophages. The in vitro generation of monocyte-derived macrophages allows to investigate their role in numerous research applications. PromoCell provides a complete macrophage cell culture portfolio including macrophage generation media, cryopreserved human macrophages, cytokines and cell biology tools for subsequent analysis.